Руски транспортен самолет Ан-12 (№ 12162) е паднал върху военни складове край Иркутск, Русия, при захода за приземяване. Няма оцелели от намиращите се на борда 9 души, от които 6-членния екипаж и 3-ма техници съпровождащи товара. Самолетът изпълнявал полет ЛЬ-9161 по маршрута Новосибирск ("Ельцовка") - Иркутск (аеродром "Восточный”) с товар от 1.5 тона резервни части за авиационна техника. Катастрофата се случила в 21:39 местно време, като видимостта била намалена и от стелеща се димка. Открити са бордовите самописци. Разследването се води от междуведомствена комисия с участието на представители и на авиозавода в Иркутск – собственик на машината. Предполагат се основно две версии за причините довели до трагедията – погрешни действия на екипажа и техническа неизправност. Военно-транспортный самолет Ан-12 потерпел крушение в четверг вечером в районе станции Батарейная при заходе на посадку в аэропорту Иркутск-2. Все девять человек, находившиеся на борту, погибли. Трагедия произошла в 21.39 (16.39 мск). Самолет упал на склады воинской части. Никто из военных, находившихся на складах, не пострадал. На борту самолета находились шесть членов экипажа и трое сопровождающих промышленный груз, который перевозил Ан-12. Турбовинтовое воздушное судно принадлежало местному авиазаводу, входящему в состав корпорации «Иркут», и следовало по маршруту Новосибирск — Иркутск. В результате авиакатастрофы были разрушены 3 склада воинской части, где находились запчасти к автотехнике, значительные повреждения получил фюзеляж и плоскости крыла. В районе падения самолета располагается склад горючего Минобороны, военный завод по ремонту инженерной техники и база хранения, склад артиллерийского вооружения и другие объекты. Пожар, который возник на месте падения самолета, был ликвидирован к 17.06. Бортовые самописцы обнаружены. В этот вечер над Иркутском стоял густой морозный туман. Специальная межведомственная комиссия начала расследование причин падения грузового самолета. An Antonov An-12 transport plane (12162 ) crashed on the outskirts of the eastern Siberian city of Irkutsk on Thursday afternoon, killing all 9 occupants (six crew members and three technicians accompanying the cargo) on board. The roofs of three military warehouses were damaged by the plane as it crashed, but there were no additional casualties. 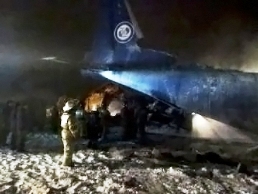 The plane was owned by the Irkutsk Aviation Plant. The plane was carrying aircraft parts from a factory in Novosibirsk when it tried to land at the Irkutsk-2 airport near the military base and struck warehouses. A criminal case was opened into possible violations of transport safety rules. 01.12.2013*/US/ WA/ Richland (KRLD) - A Cessna 177RG Cardinal (N7592V) made a belly landing. */US/ ID/ Yellow Pine/ near Johnson Creek Airport (3U2) - A Beech B36TC Bonanza (N36ML) with 5 people (family members) on board is missing. 02.12.2013*/Puerto Rico/ Arecibo/ Sabana Hoyos - IBC Airways Swearingen SA227-AC Metro III cargo plane (N831BC) crashed in a wooded area. Two people, including a Dominican pilot, were killed. */Nigeria/ Maiduguri Air Force base - Three decommissioned military aircrafts, MiG-21, as well as two helicopters were incapacitated by fire from the terrorists. */France/ Coulommiers–Voisins Aerodrome (LFPK) - A training ELA Aviacion Autogire gyrocopter crashed killing the flight instructor and the student-pilot on board. 03.12.2013*/US/ FL/ Cresent City/ Jim Finlay Farm Airport (28FL) - An Aero Commander 680-E (N71DF) crashed shortly after takeoff injuring slightly the 4 occupants. */Romania/ Targu Mures - A Cessna 182 crashed on takeoff. The pilot received minor injuries. */US/ NC/ near Green River/ Corbin Mountain - A Rans S-6S plane (N581TC) crashed injuring slightly the pilot. 04.12.2013*/Brazil/ PA/ Cachimbo - An ambulance Britten-Norman BN-2A-3 Islander plane (PT-WMY) crashed killing the 5 occupants. */US/ AK/ Sterling/ Dutch Landing Strip (88AK) - A Bellanca 7GCBC plane (N88342) made a hard landing injuring slightly the 2 occupants. */France/ Grand Arc - A training Aerospatiale AS 350B3 Ecureuil helicopter (F-GKMP) crashed due to a hydraulic failure injuring seriously the 2 occupants. 05.12.2013*/Russia/ Tomsk Oblast/ near Kargasok - A Mi-8T helicopter made an emergency landing shortly after takeoff, damaged. No injuries. */US/ CA/ Fair Oaks/ Phoenix Park - A Piper PA-24-250 Comanche plane (N6595P) made a forced landing, damaged. 06.12.2013*/US/ SC/ Berkeley County Airport - A Grumman American AA-5 Traveler plane (N1378R) crashed on landing. The pilot sustained minor injuries. */Philippines/ Leyte/ Between Burauen and La Paz - A military Bell UH-1H Huey helicopter (940) crashed injuring the 8 occupants. */Turkey/ Batman - TAI Anka UAV crashed during a test flight. 07.12.2013*/Brazil/ Brasilia - Federal District/ Aeroclube de Bras?lia - A Quad City Challenger II plane (PU-WAV) crashed on approach. The pilot and his female passenger were injured. 08.12.2013*/France/ Meaux-Esbly Airport (LFPE) - A Pitts S-2B Special plane (F-GEAL) made a hard landing. No injuries. */Colombia/ Amalfi - An Urraco AG501 plane (HJ-028) crashed on approach due to a strong gust of wind. The pilot was injured. */Australia/ NSW/ Byron Bay - An Eurocopter EC 120B Colibri (VH-VMT) crashed on landing. No injuries. */Switzerland/ Brenay glacier - A Robinson R44 Ravel helicopter crashed injuring slightly the pilot, who flew the Solar Impulse experimental solar-powered plane on a transcontinental trip. 09.12.2013*/Australia/ Perth/ near Berrigan Drive, close to Jandakot Airport (YPJT) - A Stoddard-Hamilton Glasair III plane (VH-USW) made an emergency landing and burst into flames. Both occupants sustainend burns. 10.12.2013*/US/ FL/ Palm Coast/ Flagler County Airport (KXFL) - A training Diamond DA42 Twin Star plane (N1ER) , experienced a landing gear collapse upon landing. */New Zealand/ North Canterbury/ Domett - An agricultural Robinson R-22 helicopter crashed killing the pilot. */US/ LA/ Hammond/ NW of Hammond Northshore Regional Airport (KHDC) - An Aero Commander 112 plane (N1203J) force landed to a field sustaining substantial damage. No injuries. */Bolivia/ Guayaramerin Airport (GYA) - A military Fokker F-27 Friendship 400M plane (FAB-90) struck by bird shortly after takeoff and damaged. 12.12.2013*/US/ FL/ Jacksonville/ Craig (KCRG) - A Beech 76 Duchess plane (N6014Q) experience a nose-gear collapse during an emergency landing. */US/ ND/ Dickinson-Theodore Roosevelt Airport (KDIK) - A Piaggio P180 Avanti plane (N8870B) damaged its landing gear after an aborted takeoff. */Malaysia/ off Bintulu coast - A Sikorsky S-76C helicopter (9M-STE) ditched in the sea. Both pilots and six oil platform workers were rescued. */Finland/ Oulu Airport (EFOU) - A training Aerospatiale AS 350B2 Ecureuil helicopter (OH-HKE) crashed on takeoff. No injuries. 13.12.2013*/US/ TN/ west of Knoxville/ Hardin Valley - USNG (1/230th Air Cavalry Squadron) Bell OH-58 Delta Kiowa helicopter made a hard landing and caught fire.injuring slightly the 2 occupants. */Syria/ near Dumair military airport - A Syrian Air Force Sukhoi jet crashed on landing after it was hit by rebel fire. The pilot died. 14.12.2013*/Canada/ BC/ near Tofino/ Long Beach Airport (YAZ/CYAZ) - A Cessna 421B Golden Eagle plane (C-GFMX) crashed on approach killing the 2 occupants. */Canada/ AB/ Indus/ Indus/Winters Aire Park Airport (CFY4) - A Blue Yonder Merlin GT airplane (C-IDLE) crashed and flipped over. No injuries. 15.12.2013*/Brazil/ SP/ Aeroclube de Tupi Paulista - A Cessna plane crashed on landing injuring seriously the 2 occupants. */Indonesia/ Papua Province/ Paradise Aroanop - A military Bell 412EP helicopter (HA-5170) made an emergency landing and was damaged. No injuries. 16.12.2013*/US/ IN/ Griffith/ Griffith-Merrillville Airport (05C) - A Cessna-152 plane (N350SQ) experienced a loss of directional control and departed the runway, coming to rest inverted. No injuries. */Japan/ 60 kilometres south of Tokyo/ Miura city - US Navy Sikorsky MH-60S Knighthawk helicopter, belonged to Carrier Air Wing Five, CVW-5 of Atsugi airbase RJTA, made an emergency landing injuring 2 of the four occupants on board. */US/ MT/ Kalispell/ Glacier Park International Airport - A Beech Baron plane crashed on landing. As the pilot directed the aircraft in to land, icing caused the plane to stall and drop. 17.12.2013*/US/ TX/ Palestine/ Palestine Municipal Airport (KPSN) - An ultralight aircraft crashed injuring slightly the pilot. */Cyprus/ between the villages of Lapithos and Vasilia - An agricultural helicopter hit a high voltage wire and crashed injuring slightly the pilot. */Russia/ Bashkortostan/ 60 km west of Kumertau - Russian Air Force Kamov Ka-226 helicopter made a forced landing and rolled over on its side. 18.12.2013*/Brazil/ RS/ Itaqui - An employee of an agricultural company died after being hit by the propeller of a crop-dusting airplane. */Portugal/ Monchique - An Eurocopter EC 120B Colibri (CS-HEX) hit electrical wires and crashed killing 1, injuring 2 on board. */Norway/ Oslo International Airport Gardermoen - An Airbus A330-343X was hit by a high loader and got a hole in the fuselage. 19.12.2013*/South Sudan/ Juba Airport (JUB) - Nova Airways Boeing 737-58E jet (ST-NVG) suffered a nose gear collapsed on landing. 20.12.2013*/South Sudan/ Jonglei state/ Yuai - A U.N. helicopter trying to evacuate peacekeepers and civilians had been fired on and made an emergency landing. The helicopter was abandoned and remains unable to fly. 21.12.2013*/U.S. Virgin Islands/ St. Thomas/ Magens Bay - A small plane crashed. */South Sudan/ Bor (the capital of Jonglei State) - Ugandan Air Force Sukhoi Su-30MK2 jet shot down. */South Sudan/ Bor (the capital of Jonglei State) - Three USAF Bell-Boeing CV-22 Osprey were fired on by small-arms fire and were damaged. Four service members were wounded during the engagement. */South Africa/ Midrand - A Robinson R-22 helicopter crash-landed injuring the pilot. 22.12.2013*/Malaysia/ Kedah/ Pulau Perak - A military Sikorsky S-61A-4 Nuri helicopter (M23-15) crashed on approach injuring slightly the 4 crew members. */US/ NV/ Carson City/ Carson Airport (KCXP) - A Cessna A185F Skywagon plane (N185CY) experienced a loss of directional control and departed the runway surface, coming to rest inverted. No injuries. 23.12.2013*/Russia/ Novy Urengoy/ Yamalo-Nenets Autonomous Okrug - UTair Mi-8 helicopter collided with a transformer unit, while was taxiing after landing. No injuries. 24.12.2013*/US/ OR/ Portland/ Portland-Hillsboro Airport (KHIO) - A Cessna T182T Turbo Skylane plane (N3531F) made a hard landing injuring 1 occupant. 29.12.2013*/Chile/ Colina/ La Victoria de Chacabuco airfield - A Cessna 182A Skylane plane crashed killing the 4 occupants. 30.12.2013*/Chile/ Puerto Raul Marin Balmaceda - A Piper PA-31 Navajo plane (CC-CMM) made a forced landing, damaged. */Austria/ Freistadt/ near Tragwein - An AutoGyro MT-03 MTOsport (D-MAIV) crashed in a field injuring the 2 occupants. */Indonesia/ North Sumatra/ Karo/ Berastagi - An ambulance Bell 206B JetRanger helicopter (PK-DAL) crashed on takeoff killing 1, injuring critically 4. */US/ FL/ Pensacola (KPNS) - A Mooney M20M TLS plane (N1085S) made a belly landing. No injuries. 31.12.2013*/Japan/ Okinawa prefecture/ off shore of Kouri island - A Robinson R44 Raven II helicopter ditched into the sea. The 3 occupants were rescued by a fishing boat and hospitalized.